A lot of you have seen the Fanatics around the arena and you may have noticed them wearing scarves. These are our rally scarves (I may be one of the Wardens of the Asylum but I’m also a Fanatic). 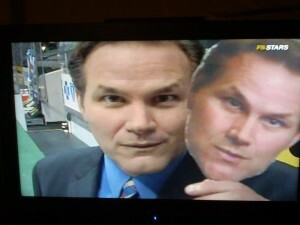 They were a fund raiser we had to help raise money for things like new banners or the fan favorite heads on a stick! Well they also serve a secondary purpose. We have tried every year to “wrap the glass”. 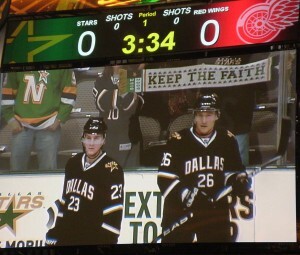 This is where we line the glass in the Stars end during warm ups and hold our scarves up to the glass. One side said STARS FANATICS and the other side said “KEEP THE FAITH” (of if you have one of our older scarves “DALLAS ‘TIL I DIE”. We did this to show the team that we stand with them no matter the out come. We believed in them. Come to the game and meet me, Mohawk Andy and your warden at StarsAsylum.com, at a place yet to be determined (we will announce this later, watch our twitter and facebook feeds the day of the game). You’ll need your own ticket to the game so if you don’t have one yet go buy it! Promise to help wrap the glass for the entirety of warm-ups (of course if someone says you are in their seat please be respectful of them). So show up early to get you one of these before they are gone!! I will post more details as we get closer. Help us show our boys we stand with them and we will KEEP THE FAITH!!! By all means feel free to bring your already owned scarf and help wrap the glass as well!!!! Giveaway! Jaromir FREAKIN’ Jagr Puck! That’s right. We are GIVING AWAY an autographed Jagr puck. FOR FREE. All you have to do is follow us on twitter and like us on Facebook. We haven’t decided which group is getting the shot. But one lucky person with be getting this super sweet signed puck. At the end of the Dallas Stars final game, hopefully it will be a playoff game, we will pick one random person from the people on Facebook or twitter. If you want to guarantee your shot at this puck be sure to follow and like us. 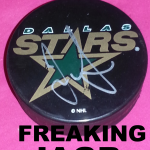 be entered to win this puck. Thanks for playing. 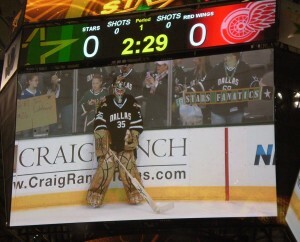 GO STARS.